Who’s the boss in underwriting? In the world of underwriting the self-employed borrower gets a ton of attention. If you ask for underwriting training, in most cases the majority of the time will be spent going over tax returns, 1088 forms, distributions, and cash flow analysis. The complexity of the income calculations can get people very worked up in trying to understand how much this person actually makes. I get it, it can be complex. But in actuality the self-employed borrower is not the boss, far from it. The lowly 1040 individual is the big dog on the block. That’s right. There are roughly four times more 1040 filed than all of the self-employed tax returns combined. If you compare that to the population of the United States that equates to the COMBINED population of all the states shown in the graphic above. That accounts for about 156 million of the 253 million total tax returns. So if you are going to see a majority of your loans with employed borrowers it would see reasonable to make sure that when you have underwriting income training with more examples of employed borrowers. Examples like commissioned borrowers, tip income borrowers, variable hour borrowers, nursing income borrowers, and the famous “skilled trade” union worker who will provide you with five to eight W-2’s and three “year to date” pay stubs to determine the income. Did you know that 53 million tax returns are filed jointly? This works out to about 20% of all tax returns. The joint tax return can be a real pain point for the underwriter. Especially when you have a married borrower who has passive income. Examples include dividend, interest, note income, and social security just to name a few. The trouble with the 1040 and the joint tax you can’t get income if you are looking at the tax return alone. Some loan officers just submit tax returns and ask you to “pull “additional income from the 1040 form with no additional information. These types of borrower income always need a supporting documentation and with 20% of the population (53 Million Tax Returns) this can cause big slowdowns in the review process. This can be a real issue if you are using tax transcripts or OCR on the tax returns. These solutions don’t work in these situations. The traditional corporation is on the decline and has been since the 1980s. Forbes shows the decline of C-coprs on a steady decline, but why? The reasons for this has a number of speculative causes varying from the corporate tax rate, statutory and effective rates. But from the underwriting perspective, expect to see fewer and fewer of these returns going forward. Thus C-corps does not get the title of King. Who is on the rise? Not all things are shrinking in corporate america. The sole proprietor is on the rise. 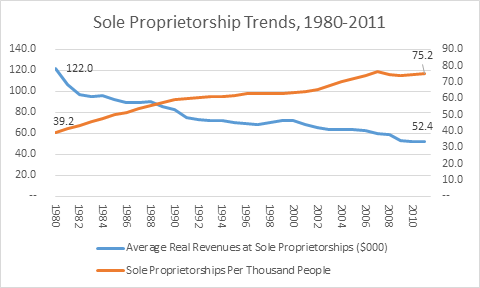 Over the last 30 years the number of sole proprietors has doubled. As of 2013 there were roughly 24 million Schedule C businesses filing tax returns. The bad news is the average income of the sole proprietor has declined by half. Despite this reduction the quantity of Schedule C tax returns is on the rise, so expect to see more and more of these in underwriting. Pass through businesses now account for 64% of total business net income and employ more than half the private sector in the United States. Pass through business are sole proprietorship, partnerships, and S corporations. 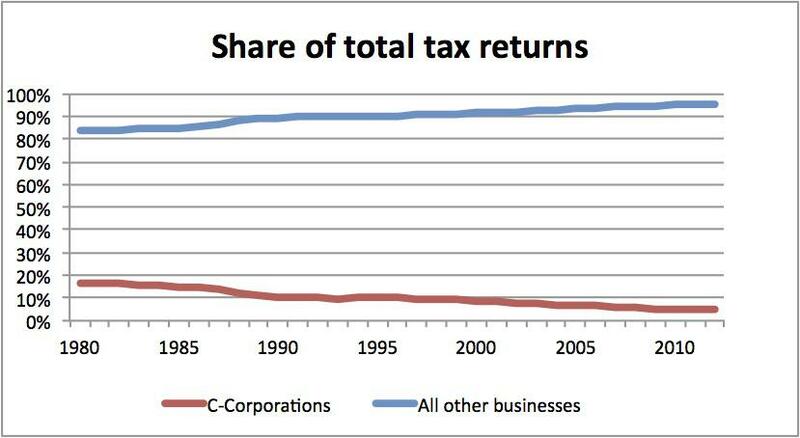 These pass through businesses tax return data shows they now make more net income than their C corporation brothers. The gap continues to widen between C corps and pass through businesses. What does this mean for underwriters? Expect to see an increase of 1065 (Partnerships) and Schedule C (sole proprietor) tax returns in the years to come. These forms combined with the omnipresent 1040 will be the dominant forces going forward. Knowing about rare tax form is helpful, but being able to master the majority of the income situations coming your way is much more useful. Get the basics down on these three tax returns to master the majority of the income scenarios. This will have big gains in quality and speed for your upcoming employee reviews as an underwriter. As a 20 year veteran of the industry, I’ve been an underwriter, sales manager but mostly as an account executive. I’ve owed my own companies, and was a partner in a software company. This product is hands downs the best of it’s kind. I know tax returns inside out, but after using the Uber-Writer I wouldn’t waste my time trying to sort through it all. If you’re in the industry, and you come within 10 miles of a credit application, this is one application that will save you much time and frustration in arguing income with underwriters. And the cost of it is simply ridiculous, you can’t afford to be without it. Thanks Will we appreciate your review of the Uberwriter! Just a couple of points to add to your comments – using Schedule C to report earnings does not necessarily make the borrower self-employed. An added layer of risk the loan may not require. Also it is my understanding a Schedule C self-employed business structure is not considered a pass through entity – only the 1065 and 1120S are considered pass-through entities as the liability of the earnings/losses of the company is passed through on to the owners based on the share of ownership. A Sole Proprietor is solely responsible – no one to “pass-through” to. Thanks for the comments! Yes we agree on the SCH C it does not necessarily make a borrower self employed, FHLMC does teach that an individual contractor is really “commissioned” versus SE when using a schedule C. A few good examples of these types of borrowers are Mac Tool Distributors or our friends who are realtors for large franchises such a C21 or Keller Williams to name a few. On the pass through yes we should have broke out the schedule C they are not a pass through :). We posted this blog due to some questions we get from newer customers of Uberwriter that were asking “what type of borrower does your clients most enter into Uberwriter”. So we went online and studied the IRS statics on where the money comes from in the US, it was very interesting!